Many of you learned this song as a child: The hip bone's connected to the back bone/The back bone's connected to shoulder bone/The shoulder bone's connected to the arm bone, but have you ever thought about using your hands to train your hips? Doing so can relieve hip pain, osteoarthritis, and more. What's so important about our hips? Tight hips can lead to shoulder, knee, and even back pain. That's because when hips are weak and tight, they can't do their job. Something has to take up the slack, and it's often our knees, our lower back, or even our shoulders handling a task they weren't meant to do. 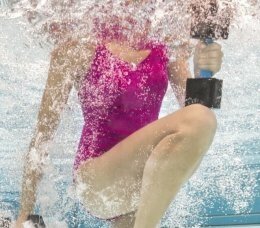 The great news is a few simple water exercises can strengthen and stretch those hips in no time and increse hip flexibilty. Let's feel the hand-hip connection. Stand upright holding a chair with your left hand. Now reach your right hand overhead in a clockwise motion. What did you notice about the rest of your body? Try it again in slow motion. Right hand reaches overhead to the right and then behind the body. You should find that the rest of your body follows along. Did you feel turning at the right shoulder, then the core, the hips, and maybe even down to the ankles? If your joints have this motion available, you should have noticed a feel-good rotation happening throughout the body. You may have noticed something different. Perhaps you felt a lot of twisting in the low back, or even the knees? If you felt pain or discomfort in the knees or back, then the exercise we're about to explore is even more important for you. Pain or tightness in this exercise may mean that your joints have limited a limited range of motion due to a surgery or injury that has left some scar tissue behind from the healing process. You may also have limited joint mobility from activities that require either a lot of repetitive motion or lack of motion, such as prolonged sitting. Moving the body in natural directions can help break down scar tissue naturally and stretch and strengthen connecting tissue that keeps muscles healthy and free to move. That's why exercises like these are so important. They help people maintain and increase hip strength and mobility. That allows our hips to support the rest of our body, and our joints to work in harmony. Using the hands to train the hips feels incredible. This 6-directional hand-reaching exercise sends a wave of movement from the shoulders to the core, hips, and even down into the ankles. You'll want to move slowly through each of the three lunges. Together, these exercises move your hips in the 6 natural directions they crave. The support of buoyancy around the body expands the feel-good nature of this move as the hips easily glide through all of the motions. Front to Back. Lunge – right foot forward and left toe for balance. Moving in a range that feels good, reach the right hand front to back. When reaching in front, move towards the surface of the water and towards the pool floor when reaching back. Sink into the hips. Feel the gentle stretch in front of the left hip. Right and Left. Next, reach right and left. Allow the hips to move away from the reaching hand and then return to start position, shoulders over hips. You might find a small range feels best at first. As you practice this side to side reaching, it will feel more natural and allow for deeper stretching. Right and Left Rotation. Finally, right and left rotation. Hand stays just below the surface. Arm reaches clockwise and counterclockwise. Move at a slow and steady pace. Using the back toe to pivot, allow your hips to follow the reaching hand. Notice the soothing stretch in the right hip in front.